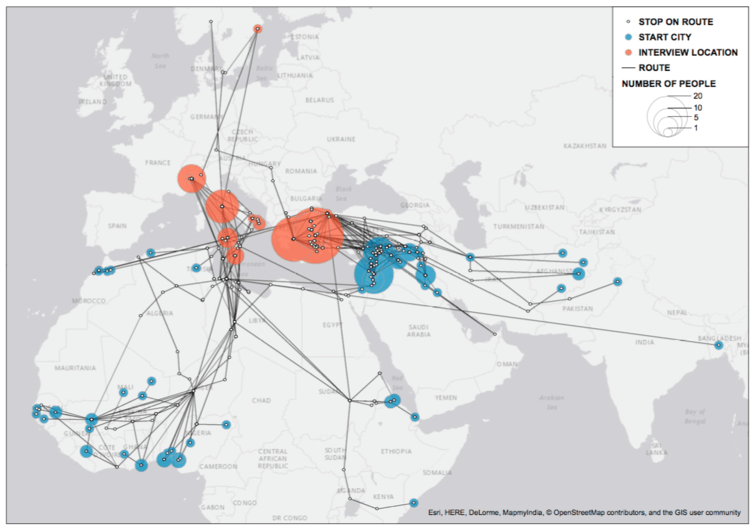 Our new research with 500 refugees and migrants in Italy, Greece, Turkey and Malta reveals a much more complicated picture of protracted, fragmented journeys. Between them, our respondents travelled along nearly 100 different routes before eventually reaching Europe, sometimes having spent months or even years living elsewhere. The convergence of these routes in Turkey and Libya helps us to understand why the number of migrants heading to Europe increased to just over a million in 2015 . For many people, the countries to which they originally travelled – including Iran, Sudan, Libya, Turkey – were initially perceived as places where they could settle and live. This is why the vast majority of the world’s refugees remain in low- and middle-income countries . These countries include Turkey, which for the second year running hosted the largest number of Syrian refugees in 2015 – an estimated 2.7m . This compared to Pakistan (1.6m), Lebanon (1.1m), Libya (up to 1m), Iran (979,400), Ethiopia (736,100) and Jordan (664,100). It was only when people found themselves unable to rebuild their lives in these places that they made the decision to move on. While all Afghans experience varying degrees of discrimination in Iran , the situation is particularly difficult for those from the ethnic Hazara minority who are more easily identifiable due to their distinctive physical appearance. Those we spoke to had experienced severe discrimination in Iran, had no citizenship rights and faced a shortage of education for their children. Combined with increasing anxieties about what would happen to them if they were forced to return to Afghanistan where Hazara are subject to increasing attacks , this had made life in Iran intolerable. News that they might finally be able to secure protection in Europe propelled those we interviewed to move on. Libya had also been a destination country for many of those we interviewed in Italy who thought that it would provide opportunities for work, as it has done for many years . But the violent, chaotic reality of everyday life in the country was very different from what they had expected. Those who had little intention of staying in Libya often found their journeys interrupted and stays extended as a result of kidnapping and violence. Others who had intended to settle, work and live in Libya came to realise that they would have to move on again to find somewhere safe.